Everyone at Animals and You is absolutely crazy about cute pets and sweet wild animals! Because of this, we know exactly what you'd like to see in your fave magazine! 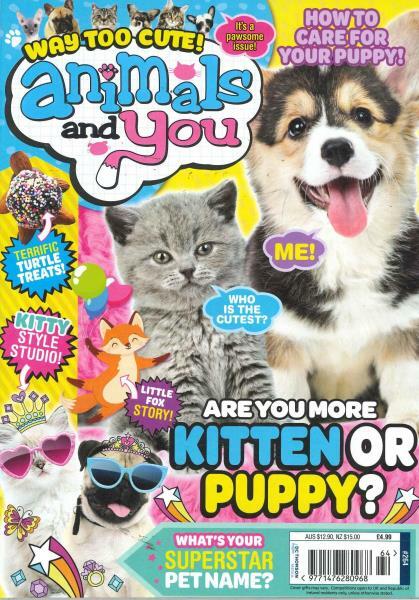 Buy a single copy or subscription to Animals and You magazine. Followed by £48.00 every 12 months by direct debit. This is a minimum 12 month term. Amazing wild animals, the cuddliest pets imaginable, top tips for caring for pets, readers' stories, animal charities, tricky puzzles and quizzes, things for you to make and bake, fun facts - and loads more! Our motto is Fun, Facts & Furry Friends - so, let's embrace the magical world of pretty pets and awesome wild cuties together! My granddaughter is delighted with her first magazine, especially the "free" gifts!